Ok. I killed him and got the horn. I sold it to a vendor for 14 plat and when I went to see what he was selling it for... He was selling for 419 pp. Why do they do that? Also I think this is a rare item because i killed him about 7 times after I got that and he didn't drop it again. I'm still trying to get it. 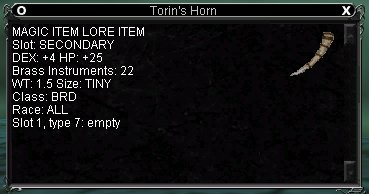 Torin's Horn is no longer broken! I just spent a coupla hours in the EC tunnel skilling up my brass with this horn. It was bugged for a long while, but I guess someone finally fixed it. Confirmed. Rose my skill from 1 to 120ish while playing our Fear song. Took about 20-30 fizzles till the song finally went through. My Bard has this instrument it goes in secondary and it IS equipable and a brass instrument. This horn is equippable, BUT your instrument skill does not go up when using it. I had my bard in PoK for hours playing a song and not one skill up resulted. Then I used all my other horns and the skill did go up. I have done this with bards on two servers now, so I don't just think that my bard was bugged. I was just running around aimlessly through Echo Caverns today and saw this bard with a horn standing there, was green to me at lvl 43 and I saw him holding a horn. Thought I'd kill him since he was glaring at me anyways. Got this horn, haven't tested out on my bard yet as he is only lvl 15 and to my knowledge you have the skill of brass but I don't think there are any brass songs before lvl 15. I'll post more when I try it out. Reeds spreadsheet v1.9 states the horn has a whopping 2.2 modifier, though I still beleive that while equipable, it is still not working. FYI, when I use the horn to play DDD, it doesnt work AT ALL. Mob gets the glow effect, song greys out, but no damage.. Hmmm, not even normal singing damage. Where did the 0.0 to bardsong come from? Has this been confirmed? I ask because I'm seeing fear land much more often when equiped. Anyone else tested this yet? I have seen and killed [was green to my lvl 37 SK] Torin spawn in the mutant area of Echo Caverns. Go through the secret door in the empty room near the soulbinder in Shadow Haven. Whjen you zone into the Caverns make a left and then a right. On your left you will see a Defender and a tattered curtain. This is the mutant area and Torin can spawn in the samll area to the left when you pass beneath the curtain or in the larger area if you follow the passage. You can see if he is holding the hiorn, otherwise he drops his necklace. is this the torin that is related to the deathmaw scales in shadeweaver? where in echo is he located? This item is now equippable. Equippable yes, but does not augment brass songs as of 01/20/01 for a 45th level Bard. As in no effect over singing modifiers. How did you get Luclin so far ahead of the rest of us? =P hehehe. Actually, Dex effects casters fizzles and (for Wizards) spell crits. I was gonna say it must be a mistake that they actually added a new instrument -it not being equippable explains it. Well as you can see from the post....there is no slot designated. I tried to equip this last night and it wont go in any slot atm. This seems to be his rare, the necklace being the more common item. I found this item. I'm a ranger, so I couldn't even test if I could equip it. I have no idea why it has a blank effect unless Verant decided only Bards could see the effect, which is highly unlikly.